Marble tiles are unique in that each one has a slightly different colour and swirling pattern, so it's no surprise that they make for one of the most exciting and beautiful flooring options available. Before settling on a type of marble tile for your home, acquaint yourself with the maintenance duties such tiles require, as well as the wide variety of tiling options this category has to offer. One of the most popular marble tiling options is Carrara marble tile. This type is normally blue-grey, white or blue and is often used for sculpture or decorative building elements. This variation has linear veining and a dramatic, stark appearance. Bathrooms often benefit from the use of Carrara tile as its pure colour adds a cleanly, expansive feel to the space. Another popular type of marble tile that is similar to Carrara, is Statuary marble tile. This tile has a more dramatic veining and a semi-translucent background that gives a high gloss sheen to the tile. 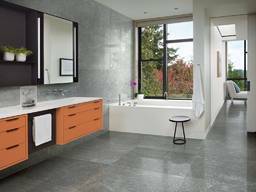 Statuary marble lends an air of lightness to a tile and is a compliment to any room. Calacutta marble tile is a rarer variety of stone and is therefore considered a more luxurious variety of tiling. Calacatta marble tiles are normally white with dark, intense veining in gestural patterns that give the tile a very striking look. Calacatta marble tile is also available as a gold marble and exudes a warm tone that matches rooms with warm colour schemes. Finally, Crema Marfil marble tile is a popular marble variant that is sourced from Spain. It is normally yellowish to light-beige in colour and is often used for flooring, décor or exterior cladding. Regardless of which type of marble tile you use, you will need to maintain the tiles to prevent cracking or discolouration. One of the best ways to protect marble tiling is to layer it with a protective sealer. Marble sealer acts by filling and closing off the porous holes that naturally occur in marble, and thereby preventing spills and messes from destroying the marble.